Fuelled by passion, coffee and cake. Taw Velo is an independent cycling club and the only British Cycling Go Ride Accredited club in Barnstaple, North Devon. 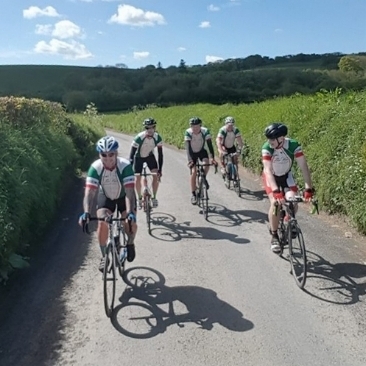 The club promotes and encourages all aspects of cycling and members take part in a range disciplines including: club rides, touring, time trials, road racing, track racing, sportives, cyclo-cross, mountain biking, and charity events. Our aim is to make cycling with the club accessible to all in the local community and to make cycling a regular habit for health, fun and fitness. Group rides are the cornerstone of any cycling club and Taw Velo is no different. Click to find out more about our regular weekly rides. Taw Velo run regular coaching sessions, events and trips for members, from supported rides out of the county and visits to a velodrome, to our annual awards dinner. To find out more about Taw Velo and what we do, visit our about page, or contact one of the team. We will be happy to answer your cycling questions about the club or cycling in the North Devon area in general. For more information, visit our contact page.